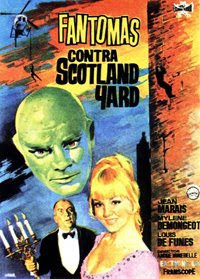 Fantomas Vs Scotland Yard is the third and final of Andre Hunebelle’s sixties revival of the Fantomas character. If you haven’t noticed yet, I find the Fantomas films to be wild exuberant fun. But if you are looking for closure in the Fantomas series – that is, you want Fantomas captured, or at least an explanation of why he does all these evil deeds – well, you’ll be sadly disappointed. This film is more of the same. A Rolls Royce follows a procession of Highland pipers through the streets of a Scottish village, before winding it’s way out of town and to a castle in the country. The castle is the residence of Lord Rashley, one of the word’s richest men. In the Rolls is Walter Brown who has been retained to draw up an insurance policy for Rashley. But Brown is not all that he seems. In fact he isn’t Brown at all, but arch criminal Fantomas, in one of his life-like replica masks. For those of you who are joining us late, that’s one of Fantomas’ specialties – impersonating them using these life life latex masks. When he is appearing as himself, he appears with a blue, bald synthetic face (I know, on the poster it looks a bit green). Fantomas assures Rashley (Jean-Roger Caussimon) that he doesn’t want to destroy the world just yet. He wishes to pillage for a bit longer. And so to his latest evil scheme – The super villain has a proposal for Rashley, which runs along the lines of: ‘if the rich want to continue living they will have to pay a tax!’ A life tax. Fantomas has set up a company to collect fees from the world’s wealthiest people. If they do not pay, Fantomas will kill them. After his proposal, Fantomas leaves Rashley’s estate by helicopter. As he circles overhead, he tosses out the real Walter brown’s lifeless body, which crashes down at Lord Rashley’s feet. It isn’t long before the press get hold of the story – ‘another Fantomas killing!’ Naturally, at the forefront of any journalism relating to Fantomas is Fandor (Jean Marais). As soon as the story breaks, coupled with his trusty photographer, and girlfriend, Helene (Mylene Demongeot), he is off to Scotland to track down the evil mastermind once more. Meanwhile Lord Rashley is implementing his own plans to defend himself against Fantomas. To do this he requires the services of the world’s foremost law-enforcement authority on Fantomas – who just so happens to be Commissioner Juve (Louis De Funes). Rashley invites Juve and his dim-witted assistant Bertrand (Jacques Dynam) to Scotland, expecting that they will capture the blue headed fiend. Later the world’s richest men all gather at Lord Rashley’s Estate to discuss Fantomas and the ‘life tax’ that has been imposed on them. During the meeting, Rashley lays out his plan to capture Fantomas in his castle. But their are further complications – Rashley’s assistant, Andre Bertiere (Henri Serre) has hatched a plan with Rashley’s wife (Françoise Christophe) to kill the Lord and inherit all his money. Unfortunately Fantomas’ plan has put a spanner in the work. But Bertiere is a resourceful young chap and he approaches some local gangsters for help. Their plan is to bump off Fantomas, but not to tell the ‘wealthy victims’ that Fantomas is dead. Instead they will collect the tax. But Fantomas is not a dimwit, and is quickly onto the gangsters plan. His response is simple, he places a ‘life tax’ on the gangsters as well. The gangster, now feeling rather threatened, hatch another plan. This time it is to join with Rashley and the other millionaires to rid the world of Fantomas once and for all. Well, this plan is rather flawed too, because Fantomas has killed Lord Rashley and is now impersonating him. While all this plot convolution is going on, we are treated to the usual repetoire of gags from Louis De Funes as Juve – a dash of derring do from Jean Marias as Fandor – and Mylene Demongeot looks as beautiful as always. Fantomas Vs Scotland Yard is as enjoyable as the previous two Fantomas films, and while this was the end of Andre Hunebelle’s trilogy, it wasn’t the end for Fantomas. The evil mastermind would pop up in productions from all around the world. For those wishing to hunt the madman down, amongst his many appearances, you can find him in Iron Claw The Pirate and Saazish, which features the fabled Bollywood Fantomas.